In honor of the upcoming New Year, I wanted to share some ideas from our Texas New Year’s Menu with y’all. Next up: Black eyed Peas! Black eyed Peas are a MUST for any Texas New Year’s Eve Menu! Black eyed Peas are eaten in Texas (and many other southern states) on New Year’s Day because they are believed to bring prosperity for the coming year. This superstition tradition is so firmly ingrained in us Texans that even Black eyed pea haters like my husband will eat Black eyed Peas on New Year’s Day. Southerners also eat Greens (collard and cabbage.. traditionally) are also on the Texas New Year’s Eve Menu because they are GREEN and they resemble paper currency = wealth. I happen to love Blacke yed Peas and sharing my favorite Southern Dishes with Y’all. So, if you want to have some Texas Style Black eyed Peas and a pro$perous New Year… get thee to the store and make sure you take this recipe with you! 4. When the peas are ready, drain them and place them in a large pot with your jalapenos, onions and salt pork. Add 5 Cups of water and bring to a boil. 5. Lower heat, cover and simmer for 1 1/2 to 2 hours. Serve with collard greens, cabbage or whatever greens represent wealth and prosperity in your area, and some yummy cornbread for soppin’ up all the sauces. NOM NOM. There isn’t a final picture, yet.. mine are still cooking and my house smells amazing!! 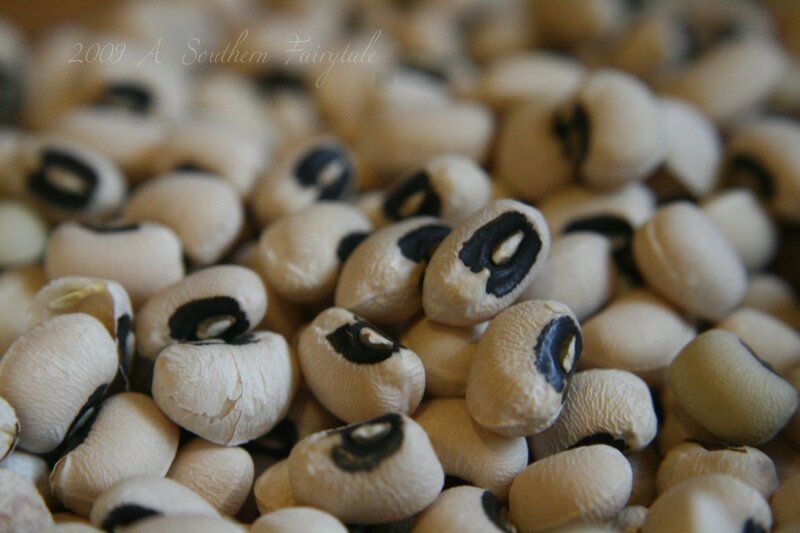 Southern BlackEye Peas, a traditional New Years recipe for Good Luck. 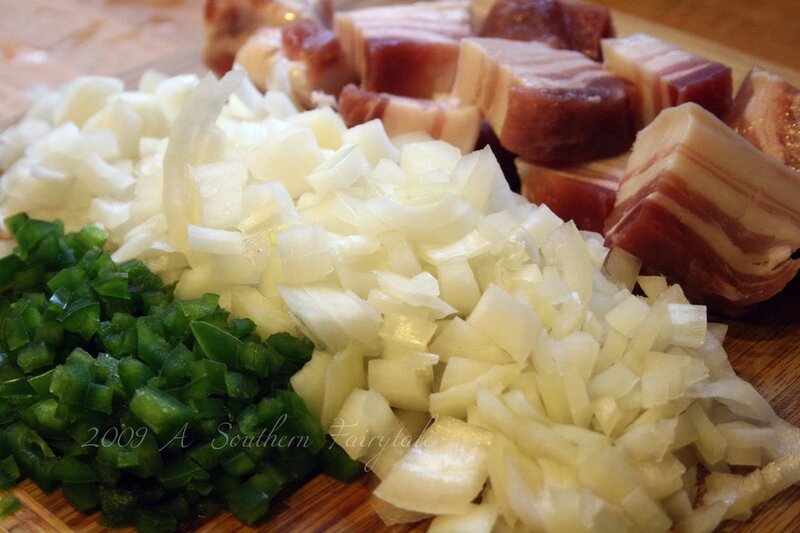 When the peas are ready, drain them and place them in a large pot with your jalapenos, onions and salt pork. Add 5 Cups of water and bring to a boil. Lower heat, cover and simmer for 1 1/2 to 2 hours. I’d love to hear about your New Year’s Tradition/Superstition Foods. Do you eat Collard Greens or Cabbage for wealth and luck? What do you HAVE to eat/do on New Year’s? My husband loves black-eyed peas. Me? Not so much. But this recipe sounds good to even me. I would make this for him, and spoon up a serving for myself. Enjoy, sweetie and Happy New Year! You just made my new year! I love black eyed peas (I’m the only one in my house) and I’m also the only one who eats cabbage. In the midwest it’s usually corned beef and cabbage or some kind of pork and sauerkraut for prosperity and luck but I think I’m going to go with your recipe. This is a really dumb question (but since I’m not considered a “foodie” or even a half way decent cook for that matter, I’ll ask it…) What’s the difference between salt pork and bacon? Can I use bacon instead. I definitely want to try your recipe – what suggestions do you have for cooking the cabbage? I usually fry mine for cabbage and noodles but I don’t think that will work out as well. Salt pork is from the belly, much like bacon, however — it’s MUCH MUCH fattier (yum) and it’s not smoked like bacon. You could also wilt — the cabbage with salt pork in a big skillet with some onion — yum. OK wilting the cabbage with the salt pork is making me hungry! I think I will go that route! Thank you Rachel – I can’t wait to try this recipe! Well, bein’ a native Texan, I know all about these New Year’s traditions, but at our house, we also had to swig down some buttermilk. I guess it was so the rest of the year would be sweet by comparison. I hated it as a kid and I still hate it, so when I married, I had to forego passing on that tradition. My mom would let me get by with just a spoonful of the buttermilk, though, so I survived. I had to laugh when you said the black-eyed peas were not the musical group…oh, yes, they are… especially when you add cabbage!!! LOL We cook our peas in left-over (Christmas) Greenberg turkey skin. Yum, spicy, but not so salty. Happy New Year’s!! I’m Midwestern by birth but Southern by heart as my TN. cousins always told me. 🙂 So I love southern traditions and food. While black eyed peas are top on my food list, I recently heard one of the funniest traditions/superstitions… pulling a dollar bill across the thresh~hold of the doorway to your home to signify prosperity coming to you. Lots of fun and different ways I guess people celebrate! Happy New Year!! I grew up in Texas and married into a family from Nebraska. I LOVE, LOVE, LOVE black-eyed peas. My husband’s family had never eaten them, heard of the tradition, and thought they are plain weird! They will always be a New Year’s Day Tradition for me! My mom and grandmothers taught me well! I’ve never eaten black-eyed peas but I love the traditions you have! Think I could handle the grape one better than the pea one though LOL. All the best of good wishes to you and your family for a prosperous and healthy 2011. Yum! We fell in love with black eyed pea tradition while living in New Orleans. This is very similar to my recipe but I use celery instead of jalepenos and add a bit of cream. Now, off to a party with a big ‘ol batch of healthified Rotel dip (Velveeta free!). Since this is my first NYE in Texas, I wasn’t sure what the appearance of all the bags of black eyed peas signified. Now I know. Now I don’t cotton to superstition, but the recipe looks good to me so I’m going to give it a try. I made these yesterday and they were great! I had a bad experience once cooking dried beans and this has restored my confidence! I made a few little changes though. 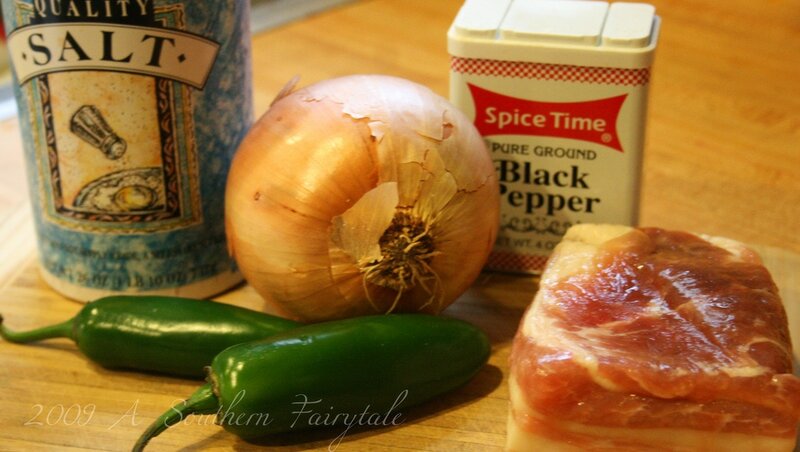 I left out the jalapenos for my kids’ sake, added 3 cloves of garlic and then sauteed them with the onions for a few minutes in bit of oil before I added the salt pork, beans and water. The beans are delicious and just what I was hoping for! Thanks for such a good, simple recipe!